With the CL514-PLUS you can check and calibrate all your RTD instruments and measure RTD sensors. Automatic indication of connections on the display for ease of use. Take it without worry into the lab, plant or field. It comes protected with a rubber boot and rugged, low profile switch. Easy to operate even in dark areas with the backlit display. Stop carrying around a decade box and RTD resistance tables, you can calibrate directly in temperature (°C and °F). The CL514-PLUS works with a wide variety of RTD curves including Platinm 100 (alpha = 3850, 3902, 3926) and 1000 (alpha = 3850, 3750) Ω, Copper 10 and 50 Ω, Nickel 100 and 120 Ω. 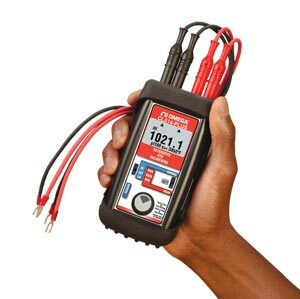 Easily set any value quickly to within 0.1° with the adjustable digital potentiometer "DIAL" plus store any three temperatures for instant recall. Calibrate quickly with automatic output stepping. Choose between 2, 3, 5, 11 and 21 steps to automatically increment the output in 100%, 50%, 25%, 10% or 5% of span. Select the step time to match your system from 5, 6, 7, 8, 10, 15, 20, 25, 30 and 60 seconds. Connect directly to RTD inputs of smart transmitters, PLCs, controllers and multichannel recorders and verify their outputs or displays. Measure and trouble shoot RTD sensor connections and find broken wires. Connect your 2, 3 or 4 wire RTD sensor and the CL541-PLUS automatically measures the RTD in °C or °F. Display: High contrast graphic liquid crystal display. LED backlighting for use in low lit areas. Nota: Comes complete with rubber boot, 4 “AA” alkaline batteries, NIST certificate of calibration, carrying case, RTD wire kit with 2 red and 2 black leads with retractable shield banana plugs and spade lugs and operator’s manual.